Bobby Breen was Born November 4, 1927 in Toronto, Canada and was a popular child singer who appeared on the stage, in movies and on the radio in the 1930's and 40's. 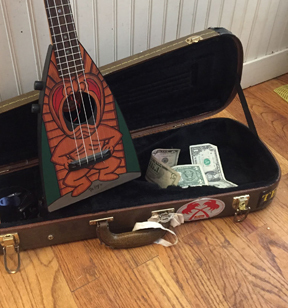 The Bobby Breen Ukulele was a painted (probably) Regal or Kay, and had a sort of Decco theme with a Bobby Breen "Signature" at the bottom. Interestingly, Bobby Breen is pictured on the Beatles "Sgt. Pepper's" album, next to George Harrison.